Oh friends, I cannot tell you how glad I am to see January GO!! I’m going to keep this short and sweet with full acknowledgement of the fact that SO many people have way harder things they are dealing with but… y’all… January was a doozy. We woke up, literally, at 2:30AM on January 1st to a water leak from our bathroom into our kitchen and… well, that pretty much set the precedent for the rest of the month. On top of home repairs etc., all four of us have had a nagging sinus infection that will.not.go.away, Sam’s had terrible ear infections, and Jeff and Nora have both had the stomach bug. To say I’m ready for spring would be a HUGE understatement. Alas, it’s only February 2nd – the halfway point of winter. The idea comes from Barbara Brown Taylor’s wonderful memoir Leaving Church. Even though most of us can easily articulate what’s killing us, but few of us pay attention to what’s giving us life. I, admittedly, haven’t been as often as I’d like, but I joined a dance-fitness studio back in December and have been trying to attend a few classes every week with a friend. I don’t know that it’s the *best* workout I’ve ever had, but it’s just SO fun. One class in particular, called “After Dark,” literally feels like I’m at a club with a bunch of girls – most of whom are awesome dancers. It’s such a break from my normal life, and I always leave feeling sweatier, happier, more energized. I’m sure this shocks no one, but nothing makes me more excited about the start of a new year (even when the start is kind-of terrible) than a fresh paper planner. This year I switched back to Emily Ley’s Daily design (I chose the Fancy Floral), and I’ve been SO pleased with it. I love having space to make gigantic To Do lists every day (that I end up transferring to the next page every evening), an hourly breakdown to map out my day, and plenty of room for notes etc. I also feel like the quality – of the paper, binding, etc. – truly gets better every year. Even better, Emily and her team sent me a bunch of their colorful, practical planner accessories to try out, and I’m totally hooked. I traded in all my colored pens and just write in it with my favorite black pen now, but I still color-code everything with the tiny coding stickers, icon stickers, flags, and washi tape. I’m also loving the adorable little coffee cup paper clips to keep important papers right inside my planner and, of course, I’m still using my Best Day Ever page marker. Call me crazy, but I find it so therapeutic when life gets hard/busy/gloomy to make a plan, build a good list, and start clean each morning — my planner is at the TOP of my list when I think of things that save me (and the little bright and happy details are the cherry on top! **THIS JUST IN*** Simplified Planners are on flash sale TODAY ONLY for 25% off — marked down to $43.00 for the Daily and only $30 for the Weekly / no code necessary. If you’ve been on the fence, now is the time to grab one!!!! Disclaimer: The above links are affiliates — see sidebar for details — but my love is REAL. Again, no surprise here, but I’m devouring podcasts these days — while I’m driving, cleaning, folding laundry, taking a walk, etc. etc. etc. etc. Some new favorites include The Liturgists, Pantsuit Politics (a good way to stay educated on the viewpoints of *both* sides without getting super caught up in drama), and Mom Struggling Well (I literally laughed out loud at the reason Emily’s family is on a budget right now and at Rebecca Smith talking about her lack-of cooking in this episode). FYI: Here’s a post from a year and half ago with many of my other favorites. One more obvious one… Reading is always my favorite, but winter especially is a great time to cover some ground… Currently, I’m enjoying the hardback version of Chasing Slow, the kindle version of I Let You Go, and the audio version of The Mothers. Sam and I also just finished up Bunnicula and Mr. Popper’s Penguins together. I LOVE that time with him and the “indulgent” time for myself when I take time to enjoy a book for ME. BTW – I’m working on a post (probably for next week) with full reviews of what I’ve been reading lately + a big list of “To Be Read” titles for 2017. *I totally just added Leaving Church to said list ASAP. Anyone read it? Our family would not survive winter without humidifiers. There is one of these running in all three of our bedrooms every night. Literally, these are saving our lives. Ok, I lied… This one is pretty obvious too, but how could I possibly make a list about things saving my life without listing coffee? I received TWO unexpected Starbucks gift cards from students this month (as a thank you for writing college recommendation letters), so I’ve been treating myself to the Starbucks drive thru for a little “pick me up” more often than usual… I also tried their new “Order Ahead’ app, and it was awesome!! Have you had the Smoked Butterscotch Latte? I admit, I was skeptical at the “smoked” description, but it is so good!!! This is kind-of corny, but I have to include it… I’ve said it a million times, but I’ve had a hard school year this year and have felt overwhelmed/behind much of the time. My students – however – have been AMAZING (even without the Starbucks gift cards). I continue to feel really honored and privileged to get to work with such a great group of hardworking, kind, and mature teenagers — they make the other less-fun parts of my job *so* much better. Since we’re talking about school, I have to mention The Daring English Teacher on Teachers Pay Teachers. I found her via Instagram a while back, but have used several of her units/lessons recently and have loved them!! I’ve also saved some really great things – especially grammar ones – to reference as I need them in the future… Her resources are very well made, visually appealing, creative, and affordable. As you know, I’m ALL about not re-inventing the wheel, and I love anywhere where teachers help other teachers and share ideas… This is a great resource for my fellow secondary English teachers out there and has definitely been a part of my personal survival as of late. Winter is hard with little kids… On the long gray days, we “play restaurant,” we build with Legos, we draw/paint, we eat play-dough, and we pull out every board-game in the house… but we also end up resorting to a lot more screen time than I’m proud of. Lately, at the slightest bit of a warmer day, I bundle the kids and hit the playground for a few hours in the afternoon after Nora’s nap instead of turning on a show. The fresh air is good for all of us, and both kids really benefit from being able to run around and get some energy out — they never complain about being cold either! Confession: I love watching The Bachelor. It’s true – in fact, I’ve got a fun post about Bachelor recap blogs/podcasts coming tomorrow – but I REALLY love it because when it is “in season,” a group of girlfriends and I actually block Monday nights off on our calendars, put our husbands on kid-duty, and hang out with each other for a couple of hours each week. I don’t know why Monday night Bachelor nights are so different from the rest of the time, but this kind of “standing date” just doesn’t seem to happen around anything else… Each season I’m reminded how much I enjoy/NEED that time to be with friends IN PERSON and wish I was better about making that a priority in general… Hopefully I will change this in 2017; but, for now, I’m thankful to Corinne and crew for making me laugh and giving me a good excuse to escape the bedtime hustle, housework to-do list, etc. for a few hours and consistently do something “just for fun” with my friends. Ok, there you have it. That was fun, and I really do feel better! If you – like me – just shed a tear when you heard ole Phil saw his shadow this morning (six…more…weeks), I strongly recommend making your own list of things saving your life (link up at Modern Mrs. Darcy too if you’d like). I’m kicking off the new (and WAY better) month with a family trip to Great Wolf Lodge this weekend (THANK YOU to all of you that wrote/commented on my last post with GW tips! ), so there won’t be any Links & Likes this week… But, as I mentioned above, I’ve got a fun post about my favorite places to find Bachelor recaps set for tomorrow, and a big post on Monday all about what I learned in 2016 and what I’m doing differently in 2017… To those of you still reading, thanks for sticking around while I threw myself a pity party the last few weeks. 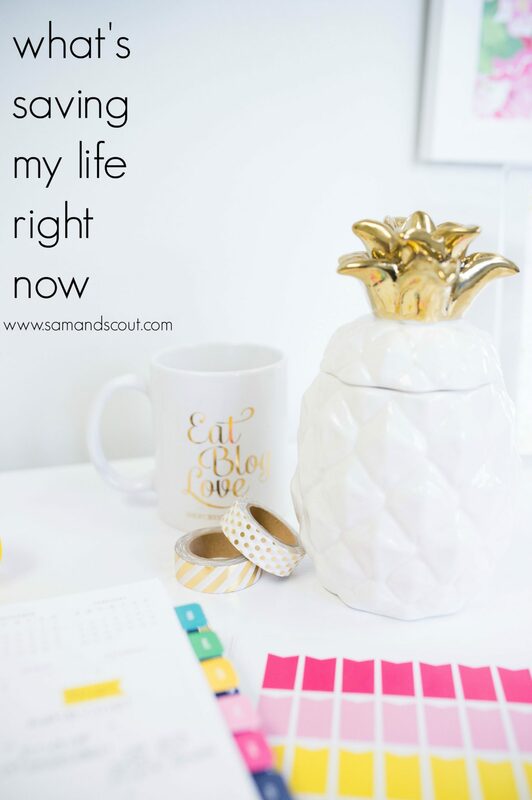 I’m excited to get back into a regular blogging routine again — I’ve missed you!! I love your list! I’m trying to get my courage up to try Zumba. I am a terrible dancer ha! I linked up with MMD too (http://www.thebamblog.com/whats-saving-my-life-right-now/)! This was such a fun and life-giving exercise.